CHICAGO: Dwyane Wade tallied 22 points in his Chicago homecoming as the Bulls showed off their retooled roster with a 105-99 win over the Boston Celtics on Thursday at the United Center. After trading point guard Derrick Rose to the New York Knicks, Chicago overhauled last season’s roster with the addition of Wade and Rajon Rondo, who signed with the Bulls in the offseason. 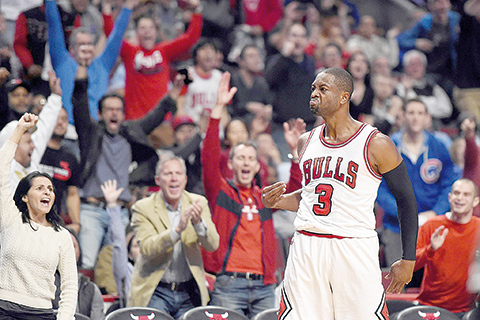 Wade, who finished with 22 points, hit four-of-six from the three-point line in his first game with the Bulls. Wade had just seven threes during all of the last NBA season for the Miami Heat. Wade, who grew up in Chicago, sealed the victory Thursday with his final three pointer of the night. He nailed a long-range shot over guard Avery Bradley with 26 seconds left in the fourth quarter to put Chicago up 104-99. “It was special,” he said of getting a chance to play for his hometown team. “I had an amazing career and 23 years ago I had a dream of playing basketball and a dream of playing with this organization and tonight it became a reality.” Wade has never been known as a three-point shooter but he’s been working on getting better at it. “For a guy who has been in the league that long it says a lot that he is willing to work hard and add a new element to his game,” said Bulls coach Fred Hoiberg. Jimmy Butler led Chicago with 24 points and Rondo added four points and nine assists. “For some guys who can’t shoot, I think we did pretty well tonight,” said Butler. Forward Taj Gibson finished with 18 points and 10 rebounds for Chicago as he earned a starting role to begin the season. Nikola Mirotic had 15 points off the bench for the Bulls, who dominated the glass 55-36. Guard Isaiah Thomas led Boston with 25 points, while Bradley had 16 points, Jae Crowder added 14 and Al Horford-a high-profile offseason signee-finished with 11 points, seven rebounds and five assists. The Celtics played their second game in as many days after defeating the Brooklyn Nets 122-117 on Wednesday at home. Chicago led the entire first half. That included a 57-49 lead at halftime, after getting a combined 28 points, 12 rebounds, 11 assists from Wade, Butler and Rondo. The Celtics are coming off two straight playoff appearances. This season they added four-time all-star Horford, who inked a four-year deal worth $113 million. Wade said he likes the way the Celtics are playing and that teams are going to have trouble stopping them this season. “You have to be at your best if you are going to beat them,” he said. Dwight Howard dominated the boards in his Atlanta debut, Paul Millsap scored 28 points and Tim Hardaway Jr. ignited the new-look Hawks in a victory over Washington. Howard grabbed 19 rebounds to go along with 11 points, just what the Hawks expected from their new center, and it certainly wasn’t unusual for three-time All-Star Millsap to lead the way in scoring. But Hardaway’s performance was totally unexpected given the way he struggled in his first season with the Hawks, when he was largely confined to the bench and even forced to spend time in the D-League. He scored 21 points, matching his high in an Atlanta uniform, and broke open a close game with back-to-back 3-pointers in the fourth. The Hawks, who led only 81-80 heading to the final period, outscored the Wizards 33-19 over the final 12 minutes. Kawhi Leonard scored 30 points and San Antonio spoiled the regular season opener at Sacramento’s new downtown arena. LaMarcus Aldridge added 16 points as the Spurs clamped down on defense in the second half led by Leonard’s strong play to win their second straight game to open the season. San Antonio spoiled Kevin Durant’s home debut for Golden State on Tuesday before sending Kings fans home unhappy on what began as a celebratory night in Sacramento. The arena was raucous pregame for its first game that counts as there was plenty of emotion from fans who remembered how close the franchise was to moving to Seattle before Vivek Ranadive bought the team in 2013 and reached a deal to build the arena. It didn’t end as well despite a strong night from DeMarcus Cousins, who led Sacramento with 37 points and 16 rebounds.